Join us on Friday March 22 to start your midwinter break off right! Grab your friends and come for an evening of postapocalyptic disco exotica, relational aesthetics, and art that your parents might hate during Teen Night at the New Museum. Explore the exhibition “NYC 1993: Experimental Jet Set, Trash and No Star,” then share your ideas in conversations led by teens. Eat Cup Noodles from a canoe, and head up to the Seventh Floor Sky Room to hear Prince Rama perform the top ten hits of 2047 AD. 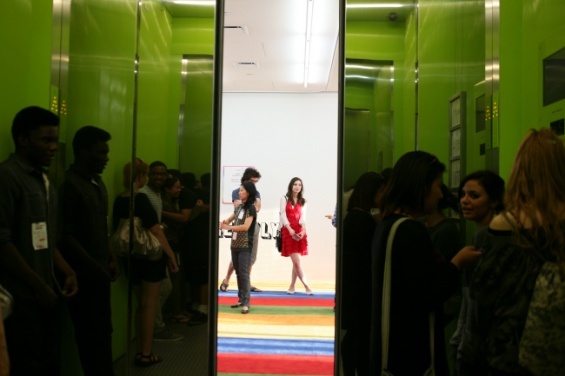 Teen Night at the New Museum is a Global Classroom program developed in collaboration with the NYC Museum Teen Summit. Global Classroom is the New Museum’s interdisciplinary art education program. Global Classroom empowers youth to think critically about global issues and develop their own cultural perspectives, and provides resources for professional educators to carry this forward. For more information, visit gclass.org. The NYC Museum Teen Summit is a collective of youth leaders representing different museums in NYC dedicated to improving and promoting the role of youth in museums. For more information, visit museumteensummit.org. The Global Classroom is made possible, in part, by the Bloomingdale’s Fund of the Macy’s Foundation, Con Edison, the May and Samuel Rudin Family Foundation, and the New York City Department of Cultural Affairs. After School Teen Programs are supported by a grant from the Laurie M. Tisch Illumination Fund.